Imagine sending this mesmerisingly beautiful fantasy card. 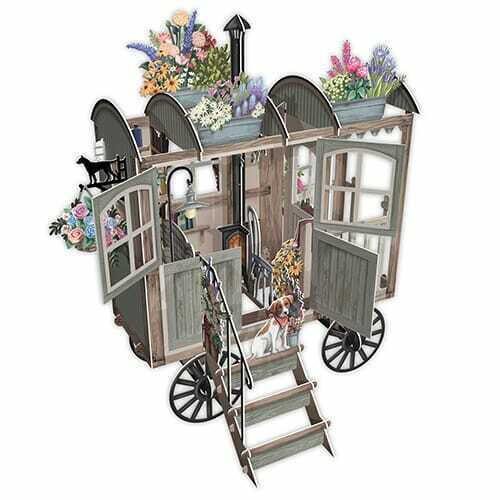 Outstanding paper sculpture and sumptuous illustration combine to make a truly captivating pop up greeting. Send to your nearest and dearest to have them struggling to believe what they are seeing when this fairytale pops out of the envelope. The Fairy Ball features a beautiful fairy couple dancing gracefully to the music of a fairy band. Flower fairies blow their tulip trumpets. A hedgehog boatman in his magical spider web sailboat ferries guests to the secret gated garden, guarded by a pair of scarlet ladybird doormen in top hat and tails. Two froggy princes look like they're hopping for a magical kiss whilst a regal looking blue bird flies in with his own flower as a tribute. Oh and don't miss the adorable white rabbit nearly hidden amongst the roses, forget-me-nots, peonies, daisies and much more! Absolutely fell in love with these cards after I was gifted one. Couldn’t find them locally so ordered from Me&McQ website. Quick and easy service from the UK to the USA. The cards are perfection! I'm very pleased with this card. The design is so original - and this particular card has a slight autumnal theme which is perfect for this time of year. Fast shipping. Will order more of these wonderful cards! Thank you! I bought this for my sisters birthday ,she absolutely loves the card.The detail is beautiful.Superb card glad I found Me&McQ . Really artistic and beautiful work of art!